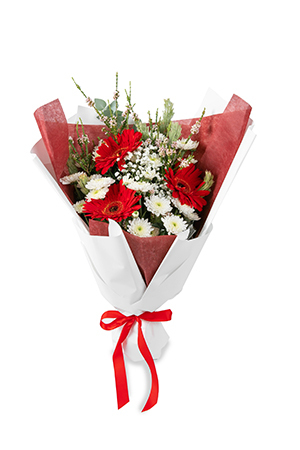 This selection of red Gerberas, white Chrysanthemums and rich seasonal greens this is the perfect value arrangement for the holidays. This fresh burst will be the life of the party, as it dazzles from the mantel or table centre. We ordered flowers they were delivered on time and quality, no fuss or stress, how easy is excellent, but how often do people or companies fail ????? II normally get excellent service from you but this time I have been unable to ascertain if my order was delivered. I clicked on "order tracking' but have been unable to get any information. Quick and easy to use. Excellent service. Deliver when requested. Flower arrangement are lovely. The ordering process was generally very straightforward. The flowers were delivered on time. I ordered flowers just after 1pm for delivery to a hospital and they arrived about 4pm - the same afternoon - wonderful service and I believe the flowers were beautiful How good is that? ?.